How Can I Make Gutter Cleaning Easier? We can’t promise to make gutter cleaning fun, but we can make it easier with these simple tips. Ladder: check. Gloves: check. You’re getting ready to clean your gutters. It’s not your favorite job around the home, and you’d prefer to make it simpler. In addition to getting your basic supplies in order, are there other ways to make gutter cleaning easier? 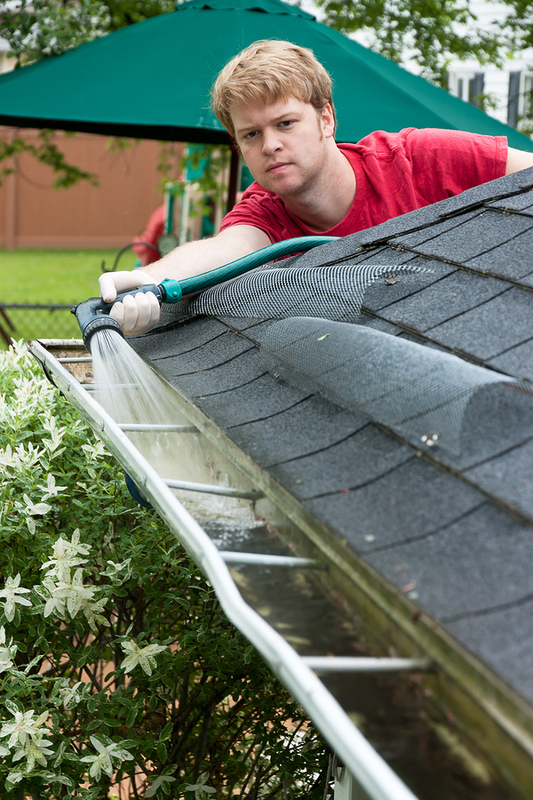 To make gutter cleaning easier, make sure that you clean your gutters on the right schedule. The right schedule depends on where you live and what your garden looks like. If you live in a desert where it doesn’t rain very often and you have a lot of lower-growing plants without large leaves, your gutters may only need maintenance once a year. For most gutters, twice a year is the minimum you need to clean. You can make cleaning easier by sticking to this schedule. When debris builds up in your gutters and then breaks down into a fine sediment, it sticks in your gutters and makes them harder to clean. Cleaning your gutters twice a year or more regularly if you have a lot of blossoms and leaves in your garden will actually make gutter cleaning easier each time because the task will be less overwhelming and you’ll have less fine debris in the gutters. When should you clean your gutters? Bring a hose to spray some of the last debris or fine sediment from your gutters. When you’re cleaning, avoid solvents and abrasive scrubbers, since these can damage the inside and the outside of your gutters and cause you more work later on. While you’re up on the ladder, you can also perform simple repair work. 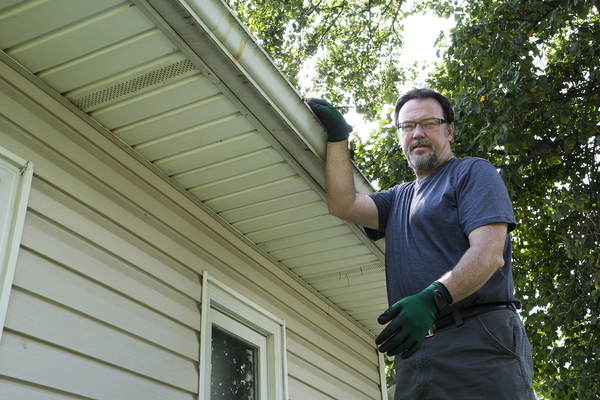 Bring up sealant and a screwdriver to tighten screws and repair tiny cracks in your gutters. This will make life easier for you in the future since you’ll reduce gutter warping, sagging, and leaks. If you love to clean your gutters, read no further. For those of you who aren’t as keen, you can reduce the need to clean your gutters with appropriate gutter covers. There are many gutter filter and guard products available that protect your gutters from getting clogged with leaves and other debris. While gutter filters placed in the gutters will catch debris, they still need management, because over time, the filters themselves can get clogged. Look for a gutter cover product that allows leaves and other finer materials to move off the edge of the gutters and onto the ground. These gutter covers make gutter cleaning easier: in fact, you’ll never need to clean your gutters again. No matter how often you need to clean your gutters, Harry Helmet can help. In fact, with our gutter covers, we can eliminate gutter cleaning from your to do list entirely. Contact us today to learn more about Gutter Helmet.